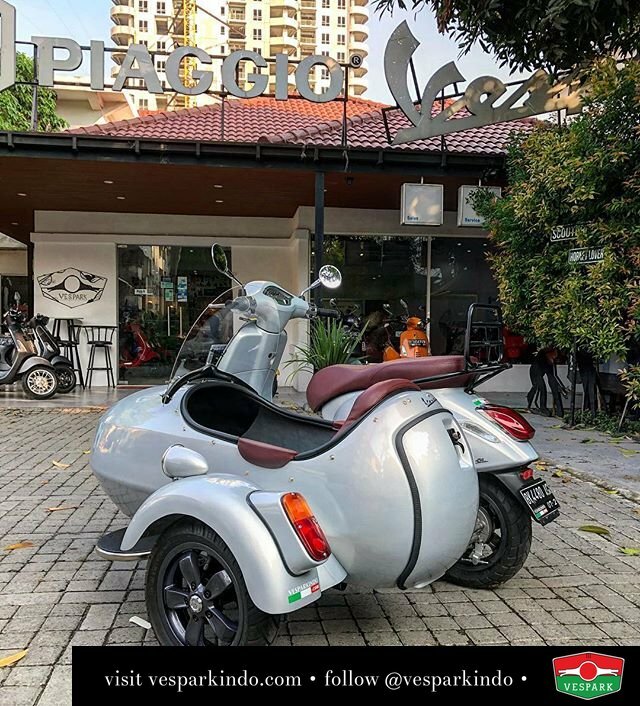 The sidecar is made from fiberglass for light weight and comes complete with wheel, connecting plate customized to the Piaggio / Vespa scooters. 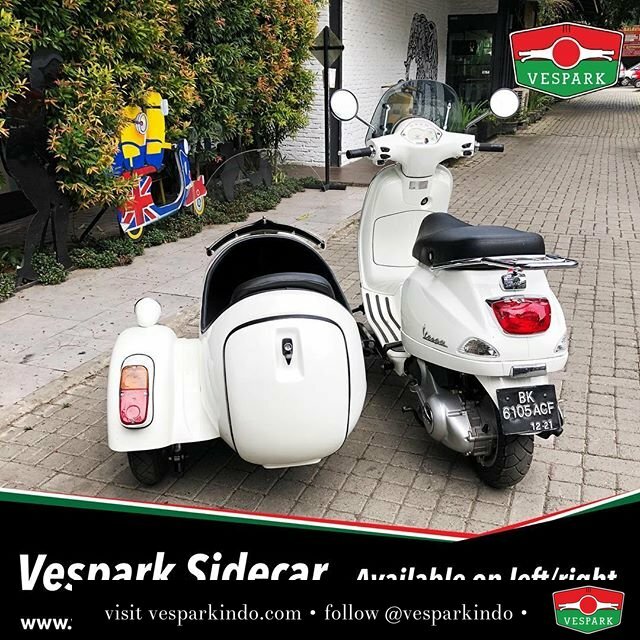 Our sidecar use a removable but strong connecting plate to connect to your Vespa, hence not permanent so you can easily remove the sidecar when needed. 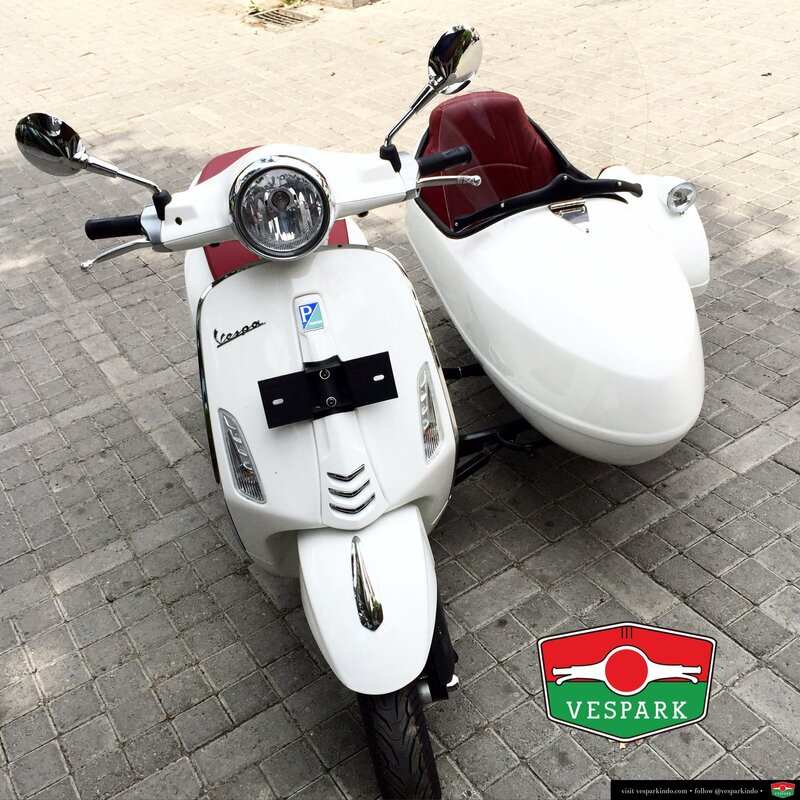 Our sidecar is 155cm long and 55cm wide, when fitted with frame and wheels, sidecar is 105cm wide. 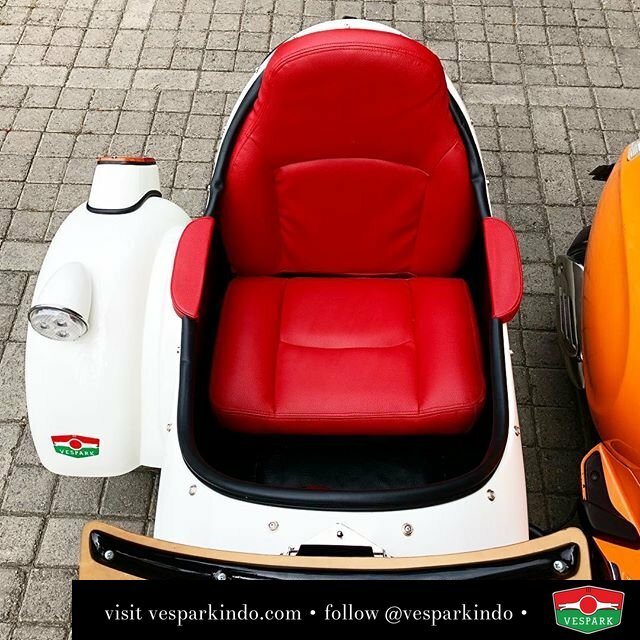 Our sidecar is build for large adults, long legroom for tall passengers 1.9m or 100kg can seat comfortably inside. 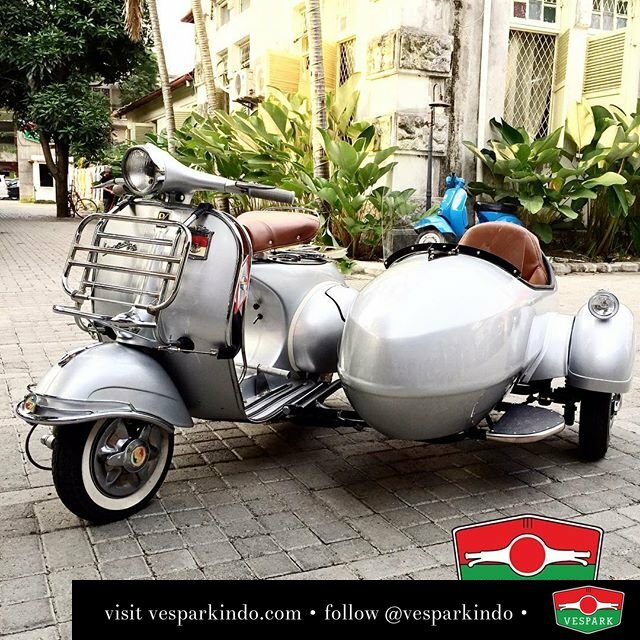 Technically, our sidecar is strong enough to carry over 300kg of load. 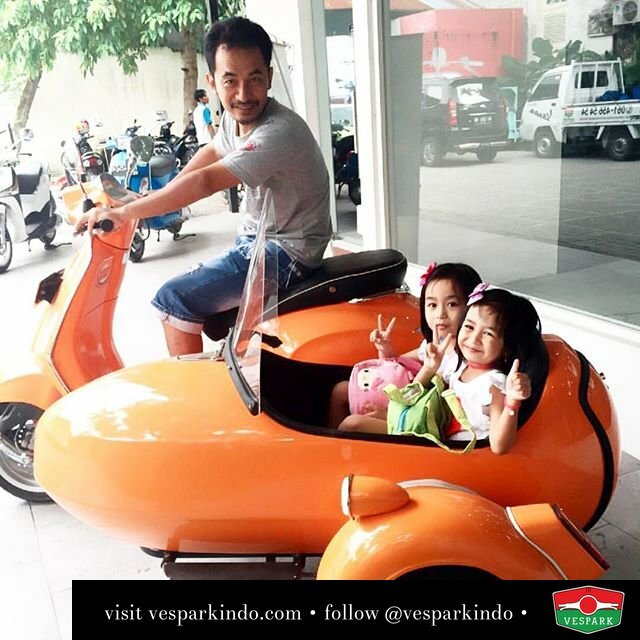 You can even fit an adult with young children inside our sidecar, see this video of a family of 4 riding our Vespa Sidecar. 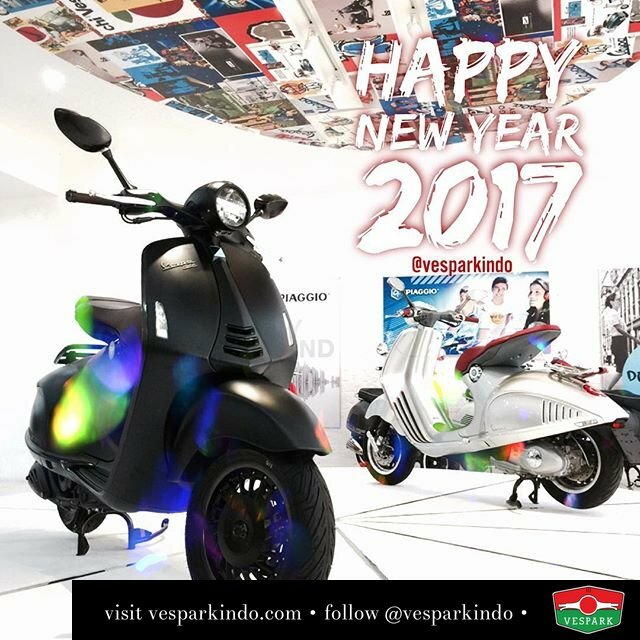 Rear and front driving lights are provided including rear turn signal for safety riding. Wirings are already included to connect to existing lights. 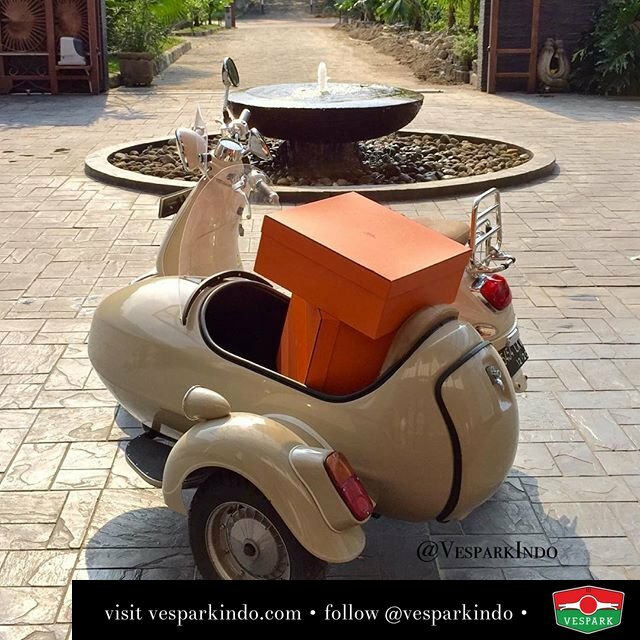 A rear lockable compartment for you to keep your bags/helmets, seat cover or other shopping. 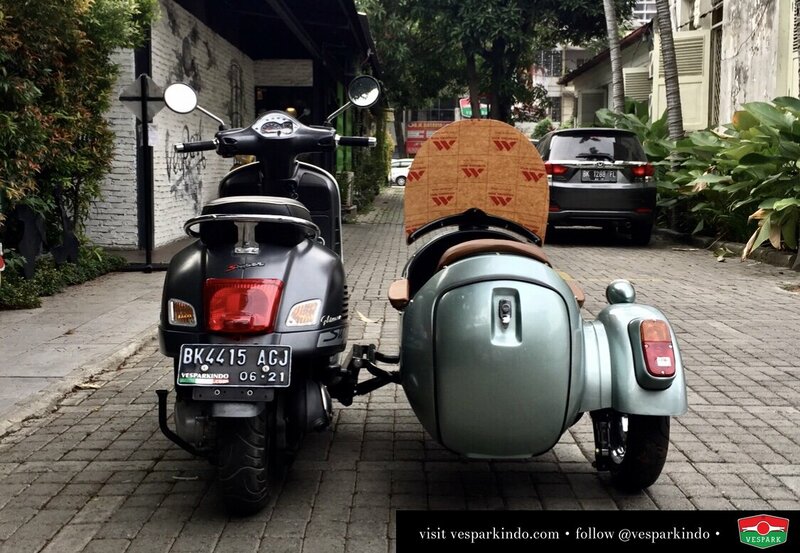 Our sidecar is weatherproof, rain water that gets in will not flood the sidecar, it will drip off. 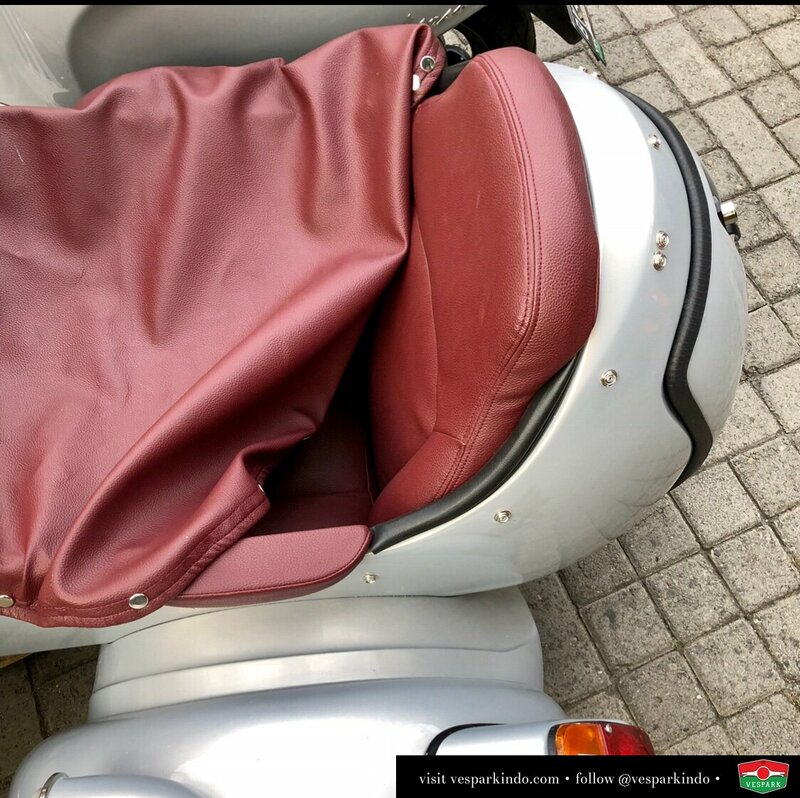 Optional seat cover for your sidecar is available to cover up the seat from weather or keep things out of sight if you want to carry things inside. An acrylic adjustable windscreen for wind and weather protection for passengers. 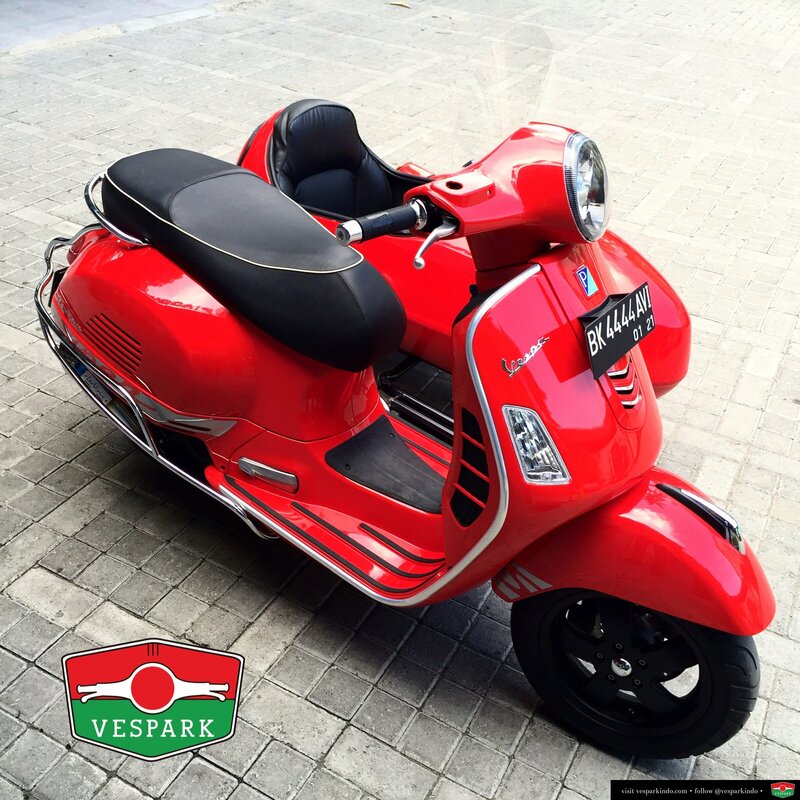 Windscreen can be folded down for easier access in and out of sidecar or removed for a sportier look. 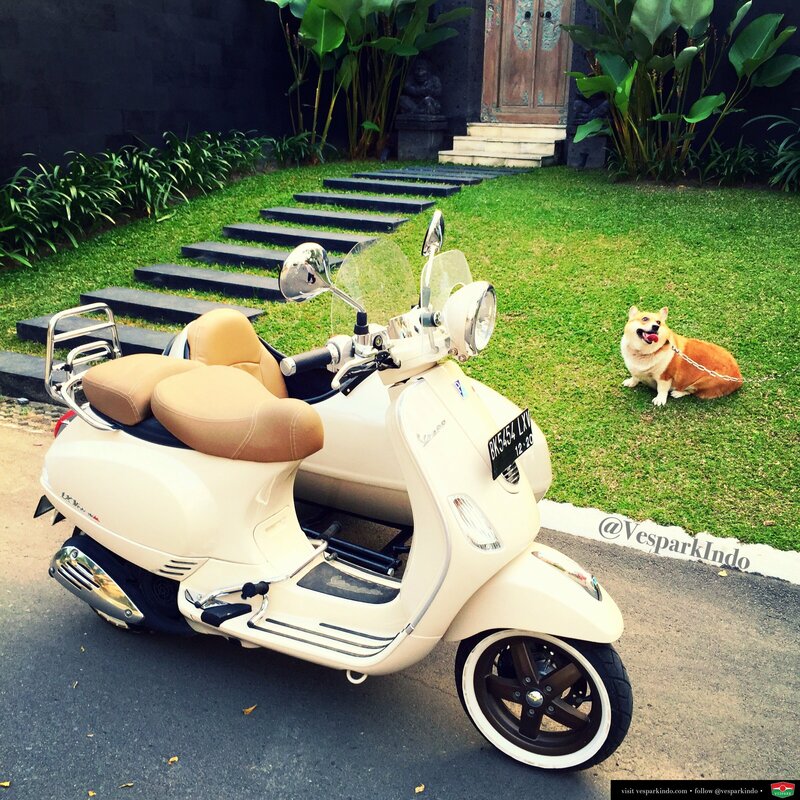 The standard sidecar wheel is 10″ classic type. 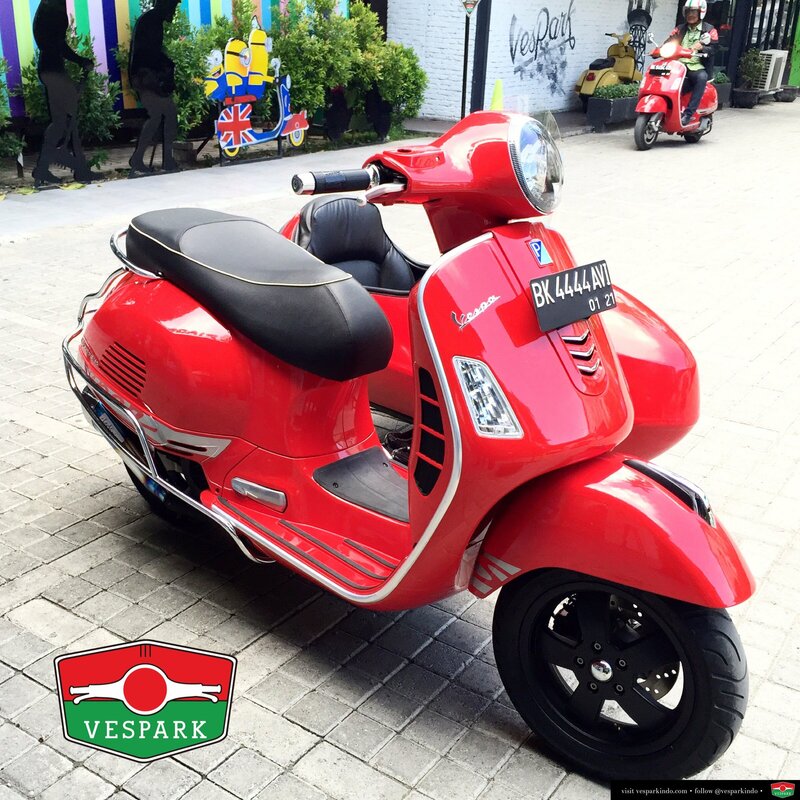 Please specify the model of your Vespa and wheel option. 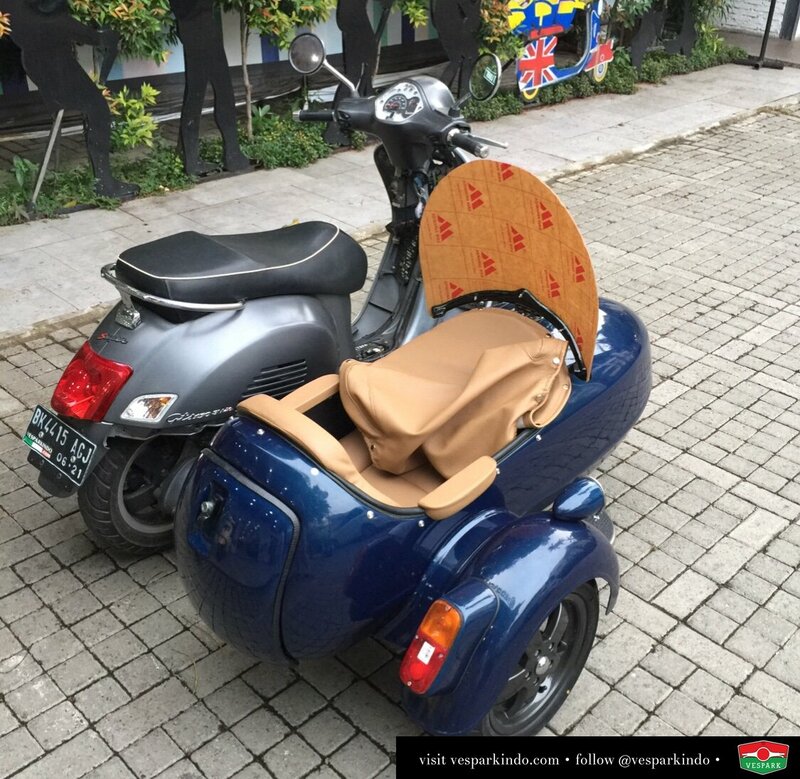 We only have one sidecar capsule design which we have designed to suit all types of Vespa. 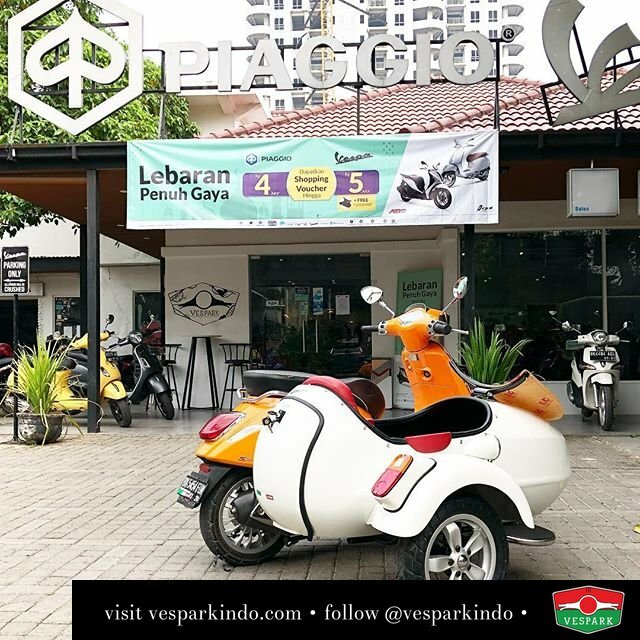 However, there is a difference in the fittings for different models of Vespa. 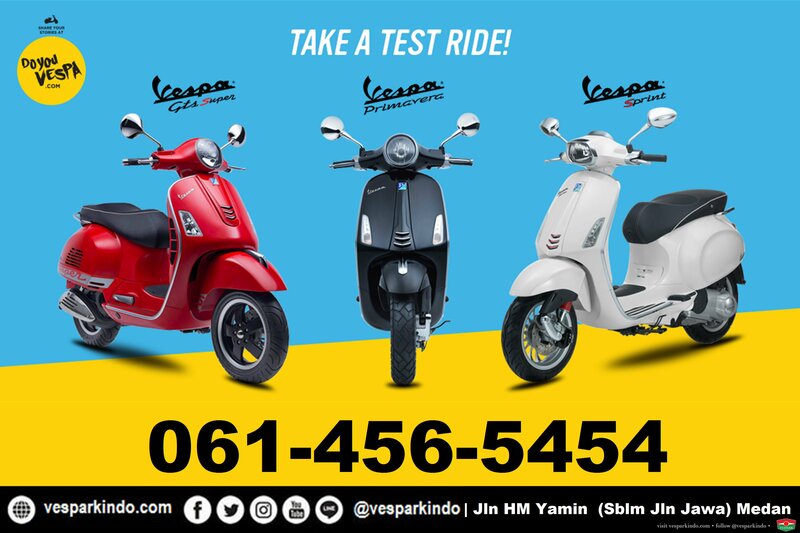 Please let us know which Vespa model you will be ordering from us. The price will be the same, we just have to give you the right fittings. 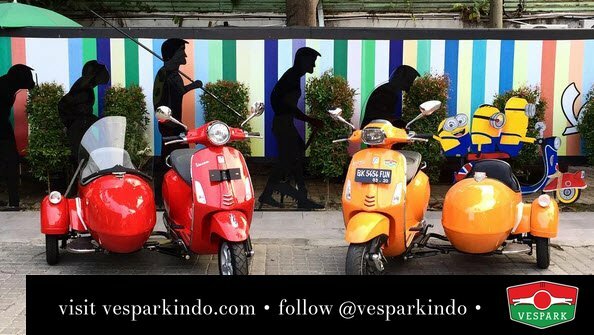 We can cater for all types of Vespa or even other makes/brands of scooters. 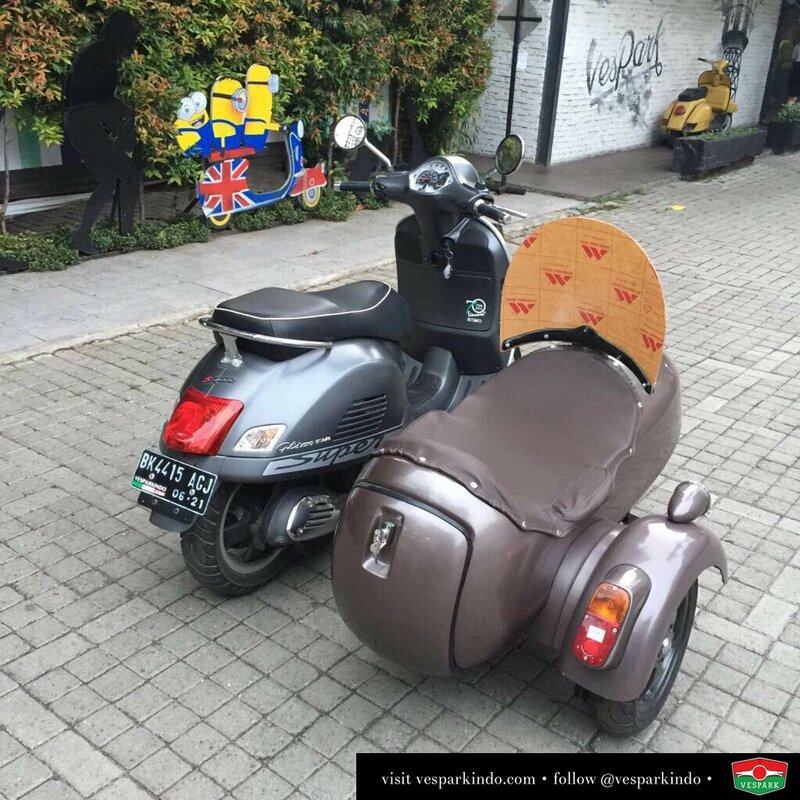 Depending on your traffic rules in your country, we can make right side or left side sidecar for export. 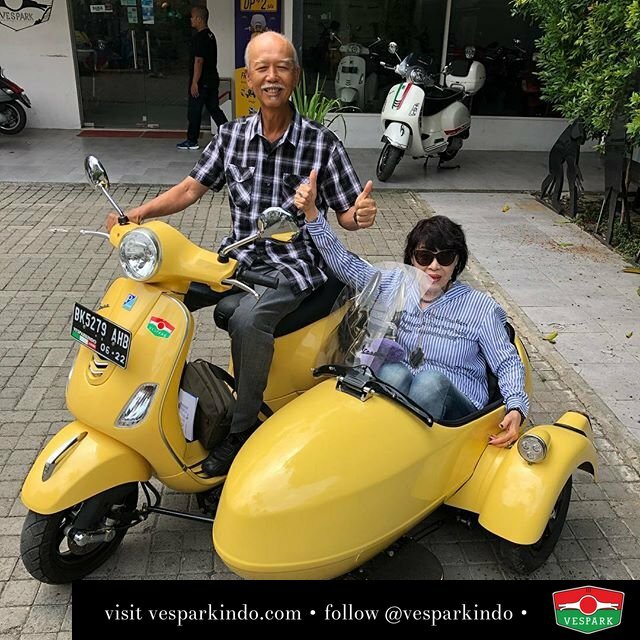 In picture: This is a right-side sidecar for export to Iran/Dubai (JEA), this is a white sidecar with Primavera wheels, we tested it on Sprint/Primavera (same type) before shipping. 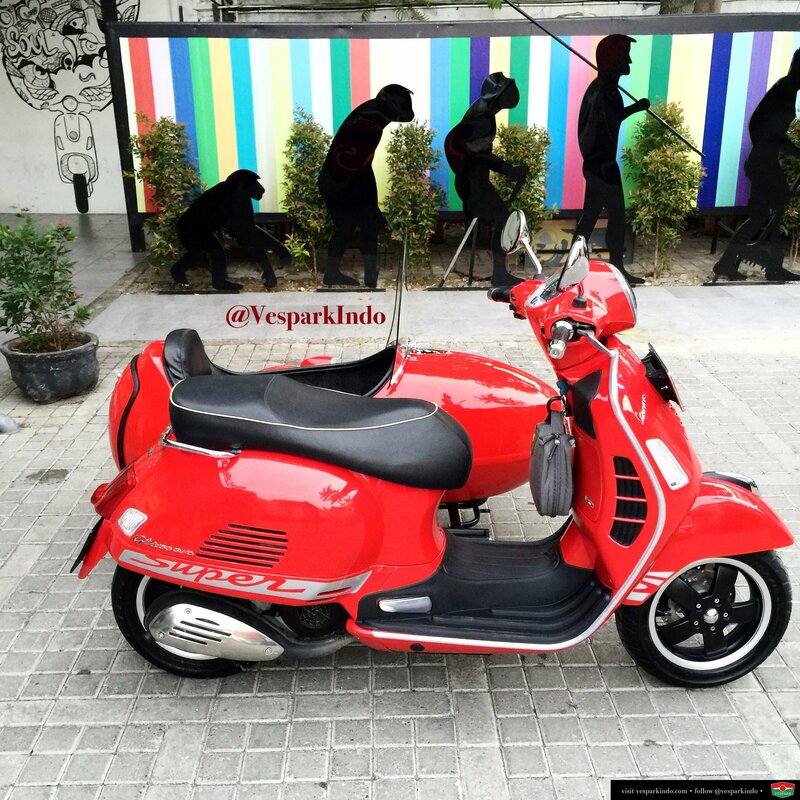 In picture: The red Vespa Primavera sidecar in on the right side of the Vespa. 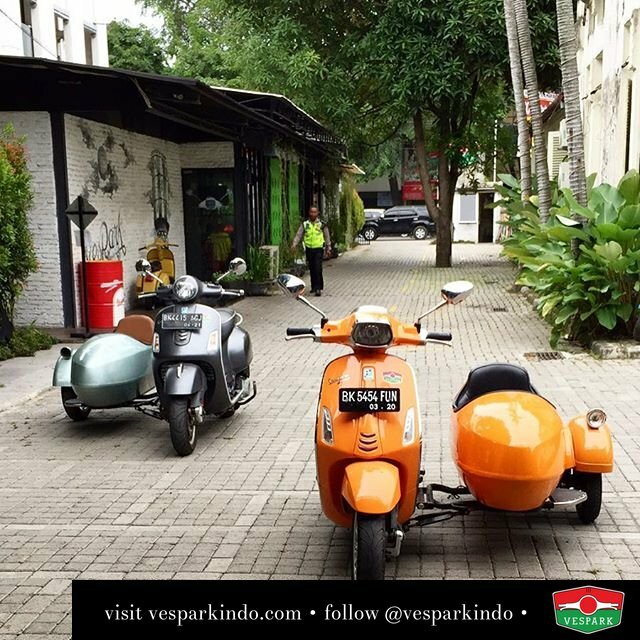 The Orange Vespa Primavera sidecar is on the left side of the Vespa. 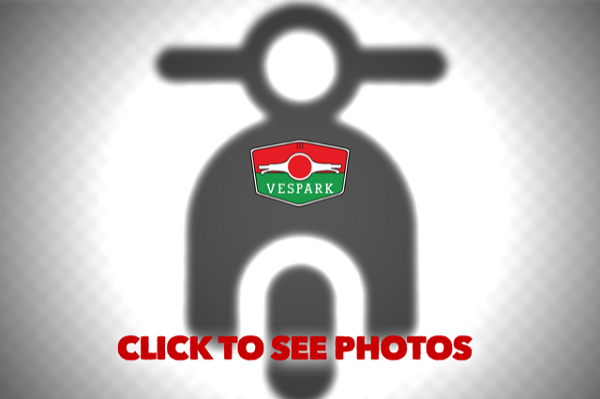 Please enquire for stock and production. 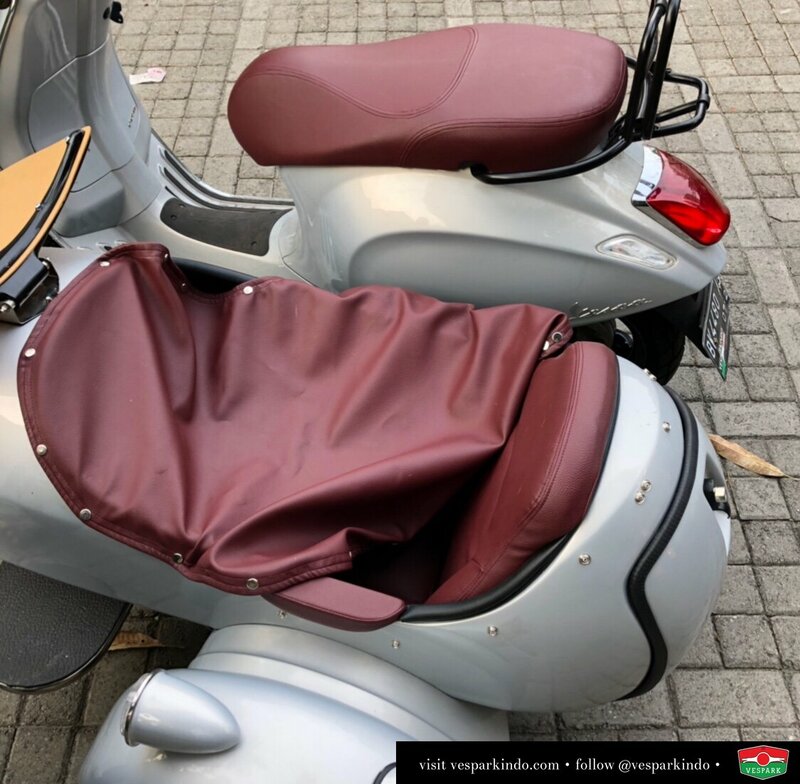 We usually have some left sidecar in stock and will take about 3 weeks for painting, leather and tests before delivery. 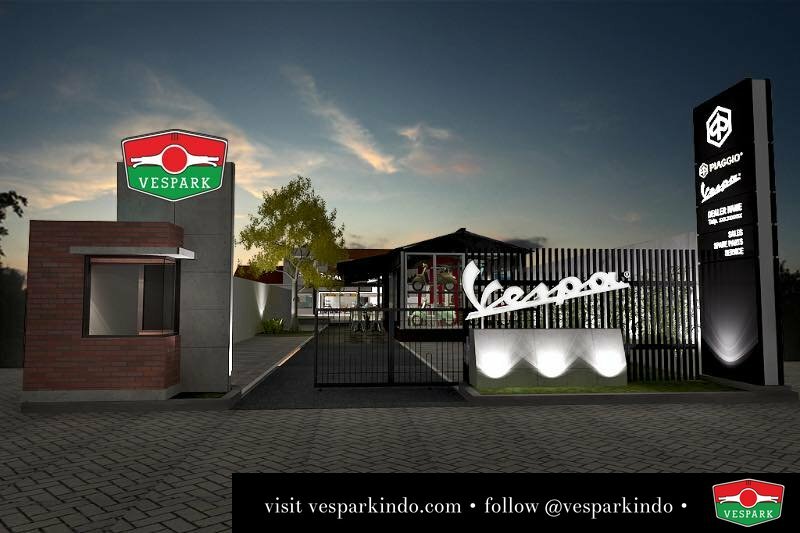 For Indonesia cities, it usually take about 7-10 days to deliver. 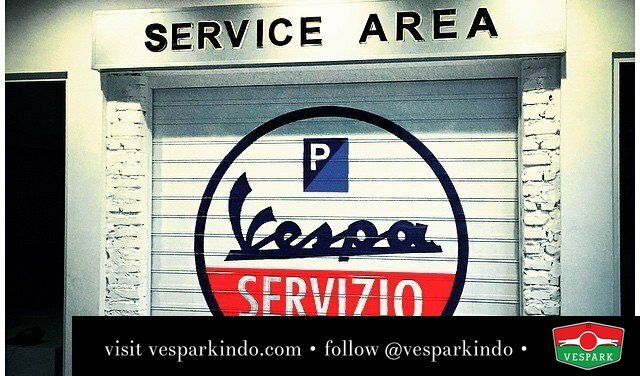 We can organize with your local Vespa dealer for fitment. 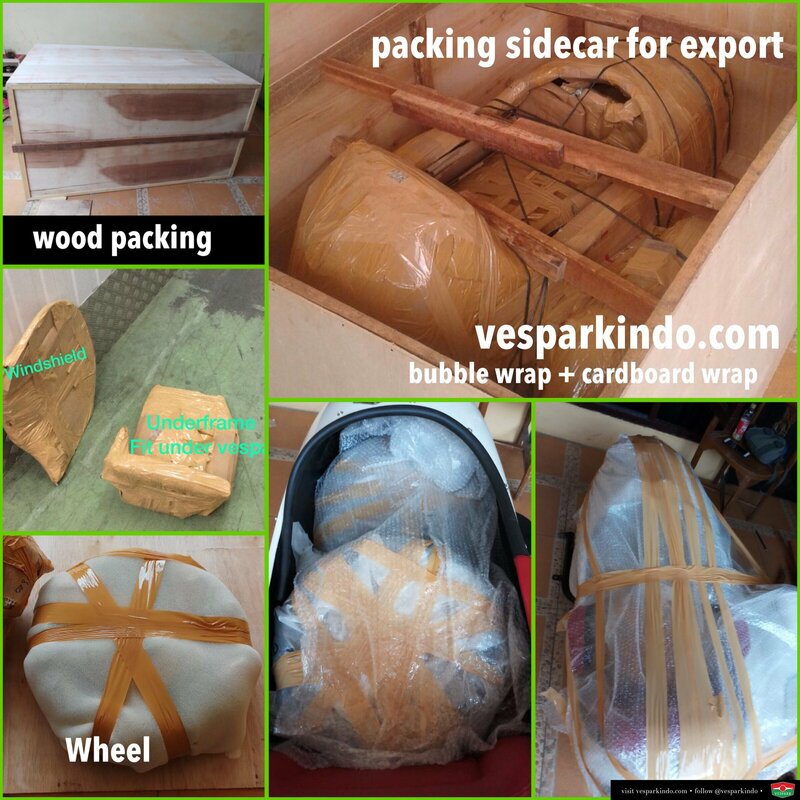 For right sidecar, we will need another 4 weeks for production and 4 weeks to get ready including packing. Total 8 weeks order time. Fitting instructions will be included. Fitting instructions will be provided, there are only 4 screws to fit the sidecar. 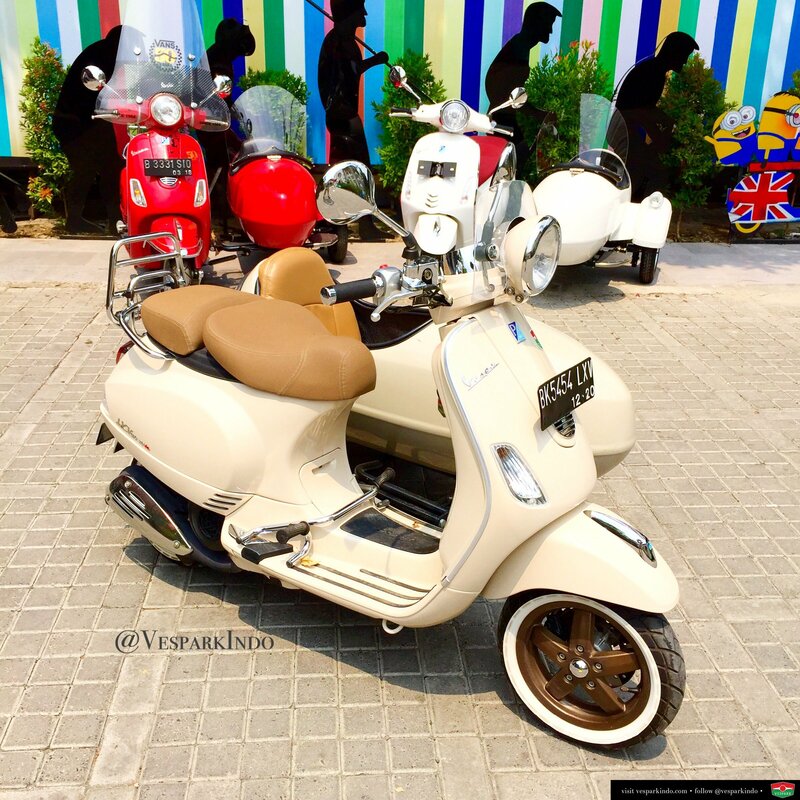 Any workshop can fit this for you. 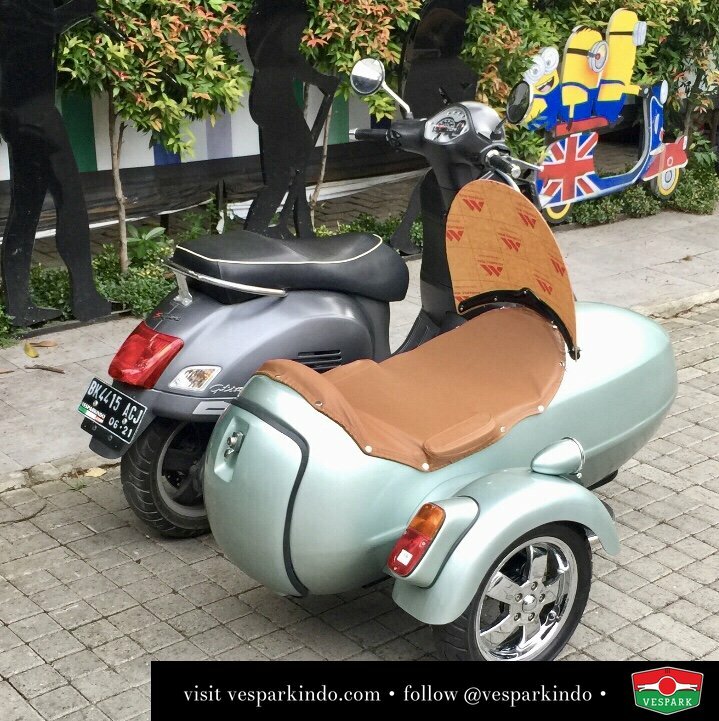 For Indonesia, we can contact local Vespa dealers to help you connect the sidecar.